Pond Liner and Pond Underlay Buy Direct and Save! Buy Pond Liner and Underlay, Butyl, EPDM, and Rubber Pond liners with Aquatic Underlay Guaranteed for Years. Best Prices, Great Reviews, Free UK Delivery! Need to know the Size of Pond Liner and Underlay You need? What type of Liner do I need? 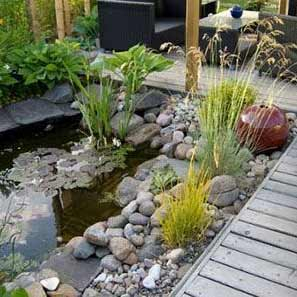 PVC is generally the cheapest form of Liner suitable for small to medium ponds. It is prone to UV degradation if exposed to sunlight which can limit is life expectancy. Probably the most robust and durable Liner material, it is inert and has been extensively tested and used for decades and is not affected by UV degradation (Tested for 50 years+), it has a “Smooth” surface finish.